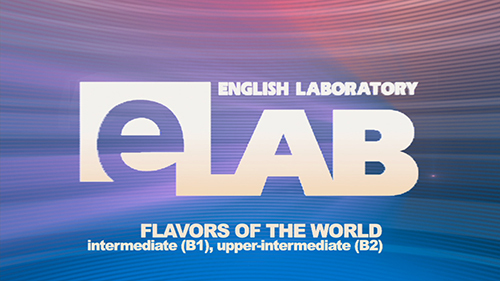 “Flavors of the World” is a part of the English Laboratory series, designed for Upper-Intermediate students. Watching this program, viewers improve their English and get to know the cultures of different countries and their cuisine. The host of the program is a native speaker. He invites a teacher to conduct a lesson for students who are then quizzed on the content of the lesson. At the end of the quiz the learners get points. These video lessons help viewers improve their English and learn specialized terminology. Learn about popular Japanese food and table manners. Post Show. Enjoy a real Japanese tea ceremony! Learn about traditional dishes for Thanksgiving Day. All about American food perfect for every occasion! Get to know traditional Canadian dishes and their recipes. Post Show. Take quiz together with the students. Post Show. Repeat all the new words you’ve learnt. Learn about exotic Thai food and useful kitchen stuff. Post Show. Consolidate your knowledge by making restaurant presentation.